During the late Pleistocene (approximately 10,000 years ago), interconnected lakes and rivers covered much of the Great Basin. At the westernmost edge of the Great Basin, the Owens River filled the Owens Lake basin to a depth of approximately 250 feet and overflowed it, continuing as far south as China Lake. As these glacial waters receded, they stranded relict populations of fish in a few spring areas, the Owens River and some tributaries of the Owens River, and the Owens Lake, which had ceased to have an outlet. Not surprisingly–given a wide range of conditions and reproductive isolation for the fish–relatively rapid adaptive radiation and speciation ensued. During the 1900s, the Los Angeles Department of Water and Power diverted the Owens River from the Owens Lake to its aqueduct, diverted Owens River tributaries, and began pumping massive amounts of groundwater, resulting in the drying of Owens Lake and the drying of many springs and seeps. Meanwhile, occupants of and visitors to the Owens Valley also introduced several species of fish as bait, for sport fishing, and for mosquito control. Consequently, at least three Owens Valley fish species came close to extinction before serious conservation efforts began. Owens pupfish (Cyprinodon radiosus), for example, settled into the Owens River valley more than 2.5 million years ago and were abundant throughout the Owens River as recently as a century ago, but the species flirted with extinction several times during the last century thanks to surface water diversions, groundwater pumping, and introduction of non-native species such as largemouth bass and bullfrogs (Rana catesbeiana). At one low point in 1969, a Department of Fish and Game employee arrived at Fish Slough at the north end of Owens Valley in time to witness the only remaining pupfish population’s next-to-last gasp as water levels dropped precipitously. He relocated 800 pupfish–the founding population of all remaining Owens Valley pupfish today–in two buckets. Since then, small populations have been established in a few small refuges in the Owens Valley in areas supplied by spring flows or groundwater. Owens pupfish were listed as an endangered species by the federal government in 1967 and by California in 1971. California and the federal government have also listed the Owens tui chub (subspecies Siphateles bicolor snyderi) as an endangered species; it exists only in a few fragmented habitats, including the Upper Owens River Gorge (below Long Valley Dam), the recently rewatered Lower Owens River Gorge (how the fish reestablished there has not yet been determined, but non-native brown trout in the area have nearly eliminated the population as well as potential genetic clues), and White Mountain Research Station (an introduced population established by individuals rescued from the Lower Gorge population). A new subspecies of tui chub, the toikona tui chub, was recently discovered at a ranch on the shore of the Owens (dry) Lake. Owens Valley tui chub behavior has not been extensively studied, although the fish appear to prefer dense vegetation for cover and habitats with low-velocity currents (such as pools or ponds). 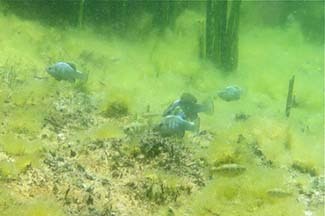 the Owens pupfish, listed as endangered by the state of California and the federal government. the Owens tui chub (Siphaeteles bicolor snyderi), listed as endangered by the state of California and the federal government. the toikona tui chub (Siphaeteles bicolor subspecies), only recently identified and extant in two small and potentially unstable habitats. the Owens speckled dace (Rhinichthys osculus), a California Species of Special Concern. Remaining populations appear to be relatively stable (i.e., not plummeting) for now. the Owens sucker (Catostomus fumeiventris), a California Species of Special Concern. Remaining populations also appear to be relatively stable for now. Non-native fish species–the majority of which were introduced in the late 1800s–now thrive in the Owens Valley. Although non-native game fish contribute greatly to the Owens Valley’s tourism-based economy, they have also contributed greatly to the decline of endemic fish in the area by competing for food and habitat and–more directly–by simply eating native fish. the Sacramento perch (Archoplites interruptus). Chen, Y., Parmenter, S. and May, B. 2007. Introgression between Lahontan and endangered Owens tui chubs, and apparent discovery of a new tui chub in the Owens Valley, California.Conservation Genetics, v. 8(1): 221-238.